Happy almost-long-weekend!!! Who am I kidding, I've been off since Friday, and have been very much enjoying the time off! But for those of you who are still working, I hope the next couple of days go by really fast for you. In the meantime, it's kind of hard to avoid the Black Friday sales coverage! There's nothing in particular that I have my eye on at the moment. I usually like the excitement of venturing off early Friday morning and seeing how shopping fate sets in! 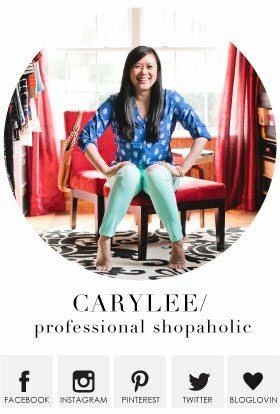 For those that need to prioritize your time and money, I wanted to round up some of my most favorite recent purchases to help jog some inspiration for you to reference during these impending (or already started!) sales! I have been wearing this jacket non-stop. You can see proper blog photos of it in this post here. It is warm and the cut and fit were exactly what I was looking for! I love that it really goes with any and all colors. 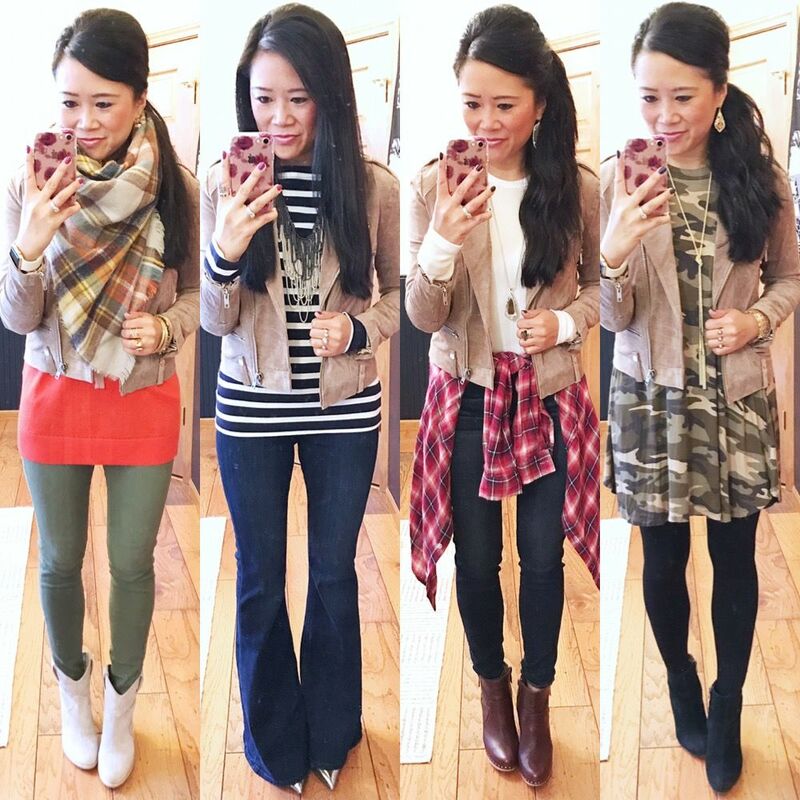 If you don't have a neutral moto jacket in your life, I highly suggest you add it to your shopping list! If you have your eye on my exact one, I sized up and am wearing a medium. It definitely runs small. If real suede or leather is not your thing, there are so many faux leather options to choose from. This minus-the-leather jacket from Express is a long time favorite. I'm pretty sure I've had it for as long as I have had this blog! My love for it has had a resurgence this season and I've basically been alternating this one with my neutral suede version! This runs true to size, I am wearing a small. You can see proper blog photos of this jacket on me in this post here. The bomber jacket is having such a moment right now, and this tapestry print makes me so much happy! 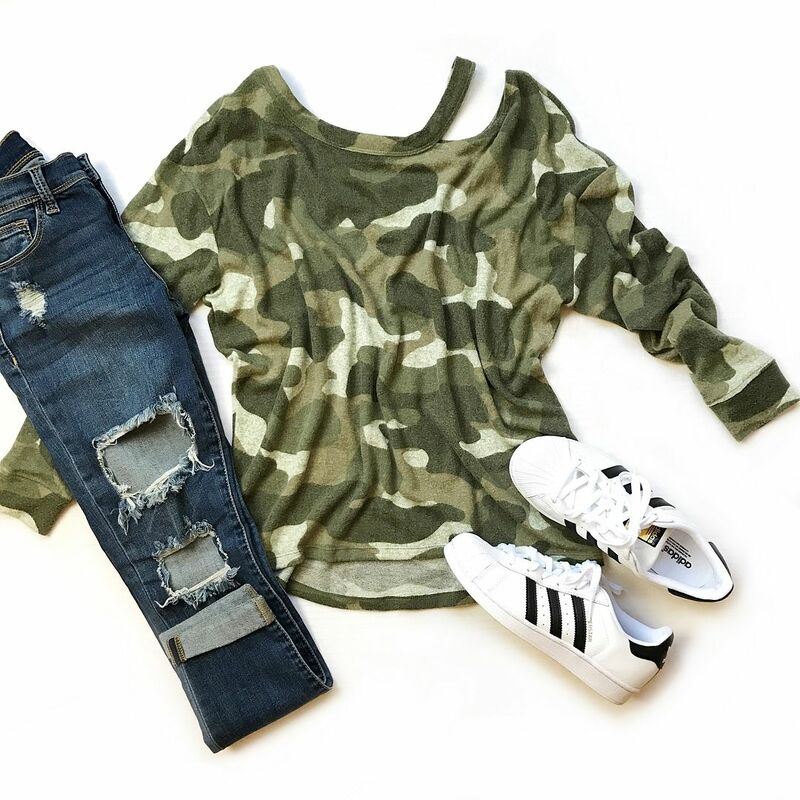 It's a great alternative to a moto jacket or a denim jacket or a utility jacket, when you want something effortless with a twist! This definitely runs big. I sized down to an XXS. Express is killing the sweater game this season! I'm obsessed with all of them, not even going to lie! It's tempting not to get all colors in each one of these styles. Though, I confess that I did end just ordered the front zip sweater in olive. Oops! I have too many olive pieces already, but I just could not resist! Talk about effortless. 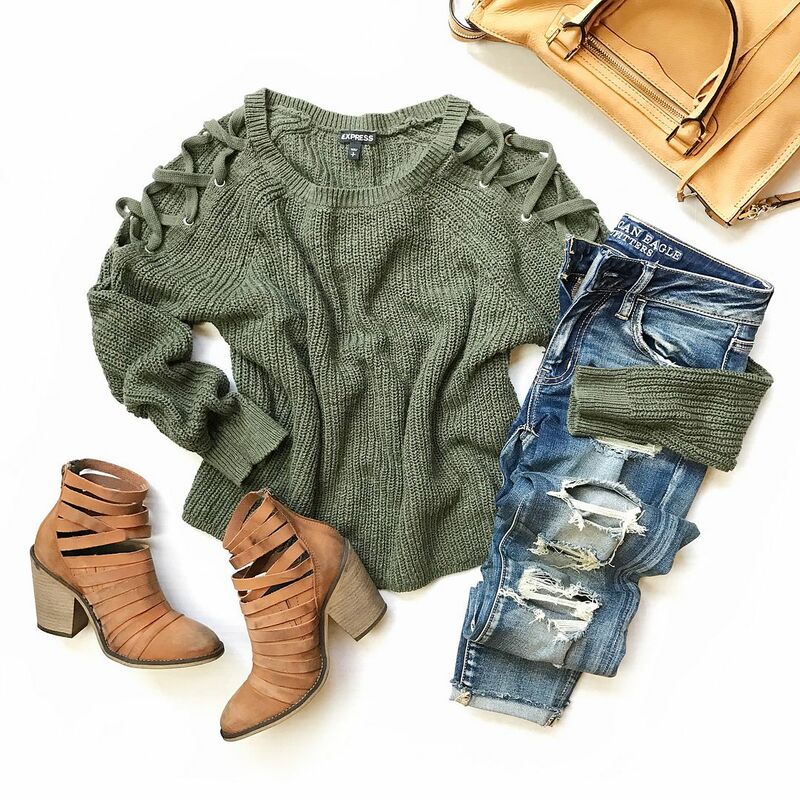 Each one of these sweaters will become a closet staple. 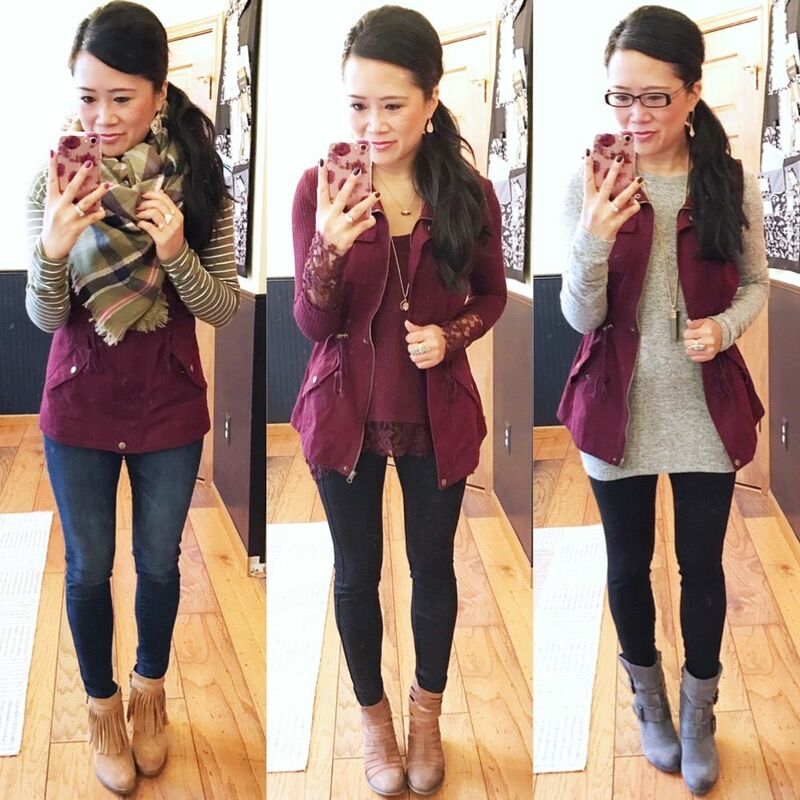 This vest is another unexpectedly favorite purchases of the season! You can see better photos of it in this blog post here. I wear my olive version so much, that wine seemed to be the next logical color to get! Especially since wines and burgundies are inherently fall and I crave them even more this time of year! If you're a collector of utility vests like I am, this one deserves to be in your collection. It's no secret that I am a big bootie addict. Wait, what? Let me rephrase that. Ahem. I am a huge fan of booties! Suede, peep toe, both, give me all of them! I have several pairs in my collection, but these two pairs probably yield the most use and the most compliments! The peep toe booties were a Nordstrom Anniversary Sale purchase. I was able to score them for $50 off, but even if I had to pay full price for them, I'd say my price per wear has got to be as low as $1 by now considering how much I wear them! There will come a time in the winter where peep toes aren't the best life choice and that's when my olive booties will come in even handier! It's a nice neutral color when I'm not quite feeling like black or cognac booties. Yep, I'm just going to go out on a limb and say that American Eagle is rocking my jegging world at the moment. You know I'm a huge fan of Express jean leggings and Gap high stretch jeans also, but when I had to replace some of my jeans thanks to my weight loss this year, I found the wash selection at American Eagle was the most diverse. Plus, they really hold their shape well. Lately I've been feeling like some of my other jeans stretch out a little too easily, but American Eagle's stay nice and fitted throughout the leg, which makes them the best candidates to wear with booties. If you haven't tried them in awhile, I encourage you to give them another go! 1. 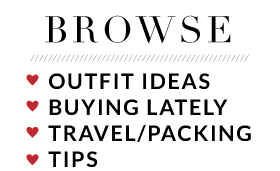 Add your Black Friday or Cyber Monday themed post (whether it's a Wishlist, Gift Guide, Sale Guide, etc.) to our link-up anytime between Tuesday, November 22 and Monday, November 28. 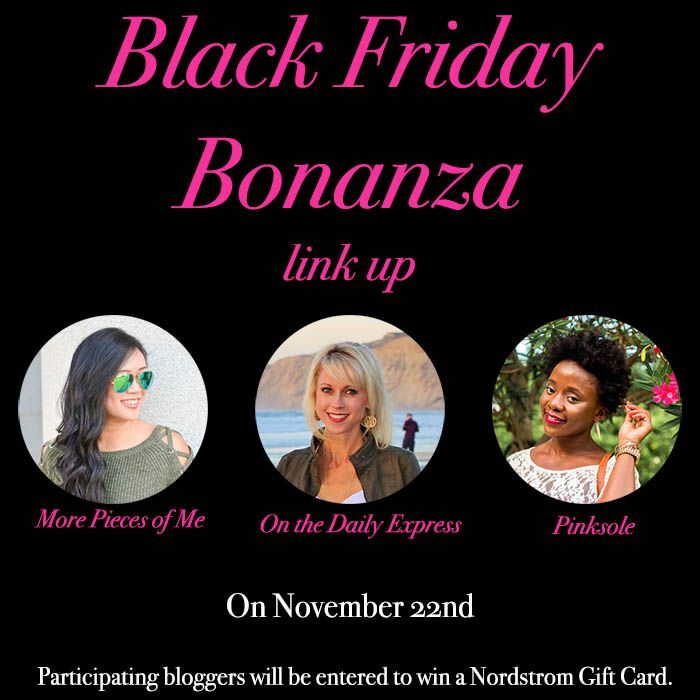 All bloggers who join the link-up with a qualifying post will be entered for a chance to win a $60 Gift Card to Nordstrom! Some lovely items here. I'm still saving for a pair of Rockstuds! So many great things! Really love that suede jacket! Yesss...love this round-up!! So many amazing pieces. I'm glad you shared a front view reminder of that olive sweater because it looks so cropped on the model (not what I want) vs. on you. Added it to the cart! 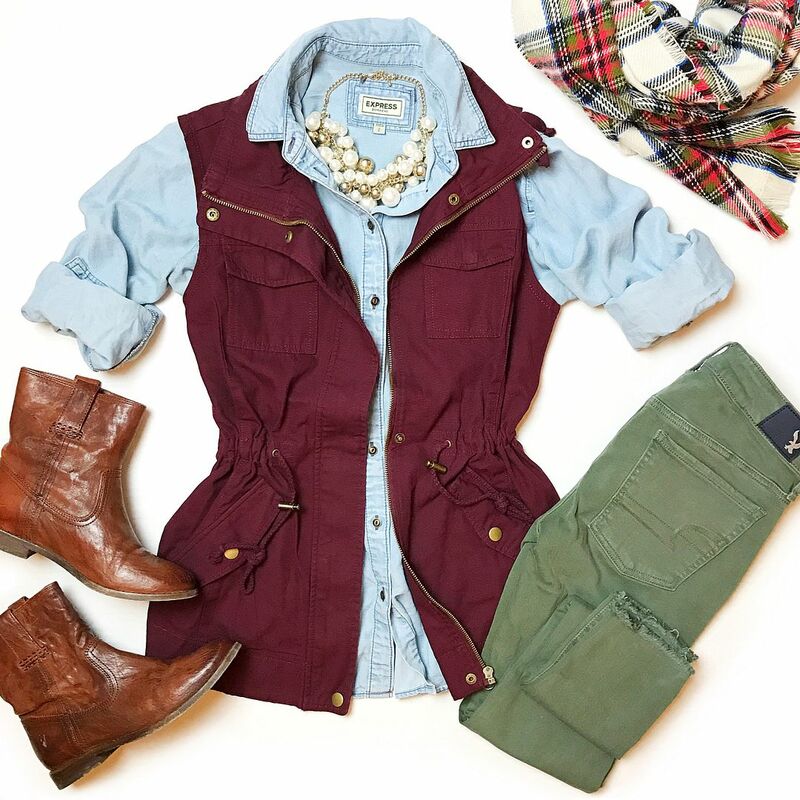 So many great pieces - love the utility vest, the tunic dress, the jackets and !!! can we just share a closet and call it a day? I have been having issues with jeans stretching out, too. There is nothing that drives me crazy more! 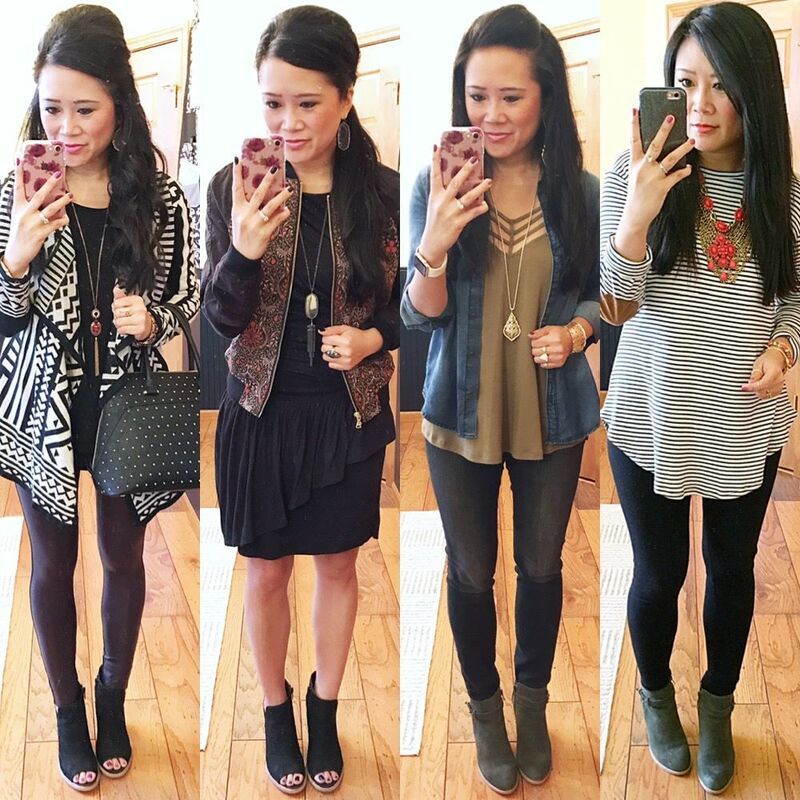 I love that suede moto jacket and Express has been killing it with their sweaters lately! Yay for a week off! So glad you've enjoyed. 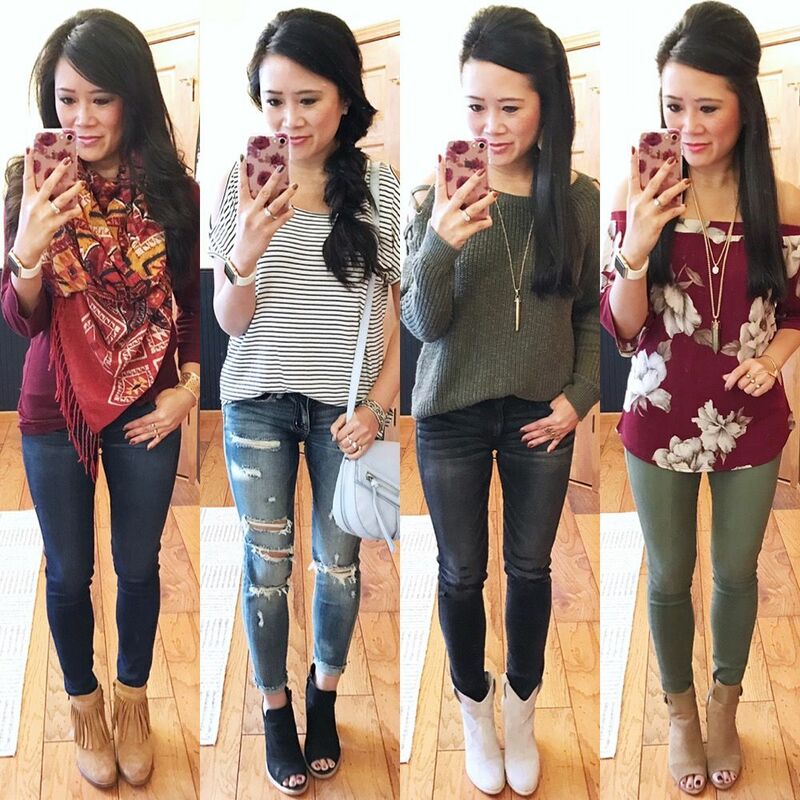 So many good outfits in this post and good sales right now!